Why it’s called “SMART” led tube lights ? (2)T5 SMART led tube lighting. they can install to current fluoresecent tube brackets without any changes to circuits existed. Global standard size and G5 or G13 pin ends. 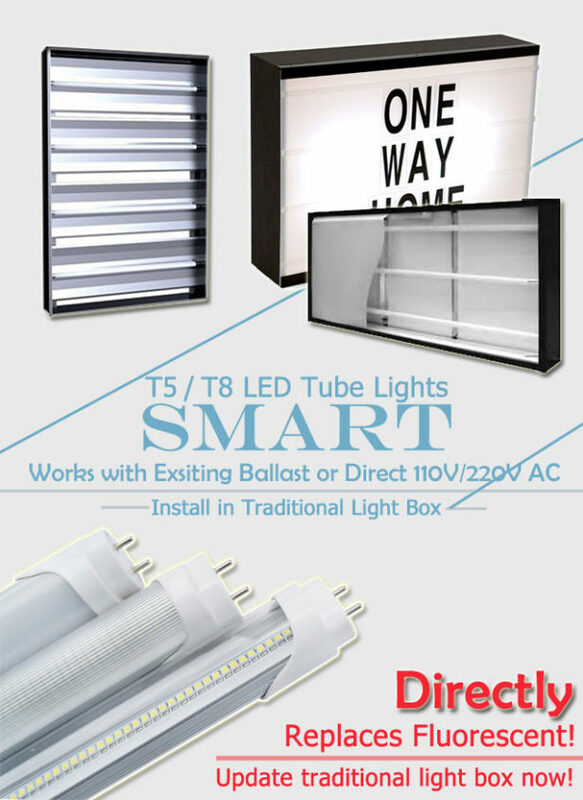 b) Smart LED tube lights is using the latest LED light 3528 SMD source technology, digital design, saving up to 60% or more energy, replaces traditional t5 / t8 fluorescent Tube directly. c) Lighting fixtures are used an all-plastics tube, and frosted shell design, more convenient to shatterproof and avoids slipping. and improve efficiency. So our LED tube light is a veritable green light source. f)Its lifespan can reach more than 30000 hours, with LED T5 / T8 led lights almost maintenance-free. g): It is easy to install, using the standard light tube dimension that can replace many kinds of T5 / T8 fluorescent.